Can Hu 'Do Something Big' on Taiwan? China seeks reunification with Taiwan. But Beijing is likely to disappointed, argues Parris Chang. Chinese President Hu Jintao was met with heavy protests on his July 1 visit to Hong Kong to commemorate the 15th anniversary of Britain’s handover of the former colony to Chinese rule. Tens of thousands of protesters took to the streets to lament that the sacred political gap between Hong Kong, now a Special Administrative Region (SAR), and Communist China was closing. The backlash against China in the SAR even has a sociological component where opinion surveys indicate that more and more residents identify themselves as “Hongkongers,” rather than Chinese. However shocking and unpleasant these developments may seem, Hu Jintao nonetheless considers the Sino-Anglo agreement that returned Hong Kong to China to be a very important and time-honored legacy of late leader Deng Xiaoping. In a similar vein, President Hu wants to “do something big” on Taiwan, according to a cable from the American Embassy in Beijing that was leaked by WikiLeaks. In other words, Hu may want to emulate Deng’s success and legacy in Hong Kong by scoring a breakthrough on Taiwan. President Hu’s approach has been markedly different. He tends to eschew the threat of force, presumably to avoid drawing attention from Washington, and places greater emphasis on other means. To start, Beijing has skillfully exploited fault lines in Taiwan’s internal politics—the bitter split between the Chinese Nationalist Party (KMT) and the opposition Democratic Progressive Party (DPP), the latter of which was the ruling party during 2000-2008. After losing to DPP candidate Chen Shui-bian in the 2000 and 2004 presidential elections, the KMT saw their new arch-enemy in the form of the DPP itself, displacing the traditional focus on the Chinese Communist Party (CCP) that controls mainland China. At that point, the CCP was merely a secondary enemy for the KMT, whose leadership had no qualms about collaborating with Beijing in an attempt to undermine President Chen’s policies and to seize power from the DPP. 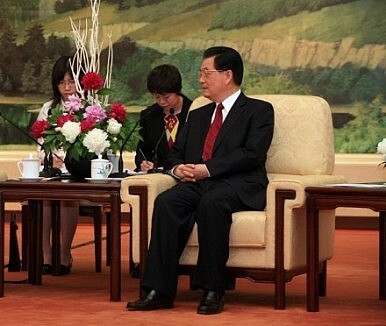 In April 2005, for instance, Lien Chan, the KMT Chairman and unsuccessful presidential candidate, visited China at the invitation of CCP General Secretary Hu Jintao to forge a united front operation. There, Lien and Hu established a forum and issued a communiqué opposing Taiwan’s independence. Unable to directly stop U.S. arms sales to Taiwan, Beijing may have opted for a subtler approach involving cooperation with the KMT, which controlled the Legislative Yuan (Taiwan’s parliament), to use procedural tactics to block the passage of the arms procurement budget submitted by the Chen government. Beijing’s manipulation of Taiwan’s political dynamics confused and misled many officials of the Bush administration and members of the Congress, who wrongly blamed the DPP government for not caring about Taiwan’s own defense and security. Ma Ying-jeou’s election as Taiwan’s president and the KMT’s return to power in 2008 marked a significant change in cross-strait dynamics and opened the door for Beijing to work closely with President Ma and the KMT. To seize the moment, Hu Jintao announced a six-point proposal to promote “the normalization of overall cross-strait ties” in a major policy speech in December 2008. Hu spoke of close cross-strait economic cooperation, cultural and educational exchanges, Taiwan’s international participation, and peace and security in the Taiwan Strait – all of which President Ma adheres to. On top of his six points, Hu is said to confide to his inner circles that it is both easier and less expensive to “buy” than to conquer Taiwan. Hence, Beijing is gradually acting on this logic through China’s municipal and provincial procurement missions that have been dispatched to southern Taiwan (the DPP’s political stronghold) to buy fruits, vegetables and other local products. A large number of Chinese tourists also visit Kaohsiung and Tainan, cities in the south. China’s economic concessions to Taiwan are not free of cost. Overall, the 17 provisions in the cross-strait Economic Cooperation Framework Agreement (ECFA) are in fact modeled on the China-Hong Kong economic arrangement (CEPA). This preferential trade agreement, if completely followed through, could effectively transform Taiwan into a “special administrative region” of China at the expense of Taiwan’s sovereignty and independence. Reinforcing this gradual shift toward Beijing are Taiwan’s large companies and “fat cats” that have benefited from the liberalization of cross-strait trade and investments made possible by the ECFA. As a result, the business elite have become an active supporter of rapprochement. Additionally, Beijing continues to manipulate the media in Taiwan and uses it to wage political, information and ideological warfare; hoping to win the hearts and minds of the people for their support of Taiwan’s return to Chinese control. According to some critics, Beijing has also been attempting to recruit fellow travelers and foster internal divisions within the DPP in order to discredit and weaken the opposition party in Taiwan and abroad. As the DPP’s principal goal is to promote an independent Taiwan that is free and separate from China’s control, Beijing (through entities like China Times, Want Daily, and CTI) appeared to campaign on behalf of President Ma, who ran against the DPP’s Tsai Ing-wen during Taiwan’s January 2012 presidential elections. As Hu Jintao comes closer to stepping down from his leadership post at the CCP during its upcoming 18th Party Congress in the fall, he may feel a sense of urgency. There are signs that Beijing is mounting pressure on President Ma and the KMT to accelerate cross-strait political talks, map out confidence-building measures to end hostility, and to conclude a peace agreement that would be meant as a foot in the door for Taiwan’s eventual unification with China. Are Hu and his advisers reasoning that through Ma’s reelection in Taiwan’s democratic process, he now possesses the mandate of the people to decide Taiwan’s political future without interference by the U.S. and other foreign influences? If China and Taiwan reach an agreement on national unification through peaceful means, they will sidestep the provisions of the Taiwan Relations Act and remove the foundation for the U.S. intervention. For Hu’s gambit to work, he will need President Ma’s close and active collaboration. But will Taiwan’s leader cooperate? At present, Ma has other, more pressing worries at home and the cross-strait relationship is not his top policy priority. In fact, he is suffering from a poor approval rating–as low as 15 percent– due to a string of official corruption scandals, unpopular domestic policy decisions, and his inept leadership. It stands to reason that he has no intention to arouse serious political backlash on the sensitive subject of China-Taiwan ties where many could perceive Taiwan’s political talks with Beijing as the prelude to Ma’s sellout of Taiwan to China. Hence, Ma has countered with a “three-no” formula consisting of “no independence, no unification, and no use of force” as his cross-strait policy. In essence, Ma wants to freeze the status quo in Taiwan’s relations with China and, in a subtle manner, is effectively saying “no” to Hu’s offer to engage in political talks with Beijing. Dr. Parris H. Chang is professor emeritus of political science at Penn State university and the CEO of Taiwan Institute of Political, Economic and Strategic Studies. He was a Deputy Secretary-General of Taiwan’s National Security Council. Massive Zhejiang Church DemolishedWhat Happens After China Invades Taiwan?KMT's Ousted Presidential Candidate Returns as Party ChairThe 228 Incident and Taiwan's Transitional JusticeHow Will Mainland China Respond to Taiwan’s Elections?